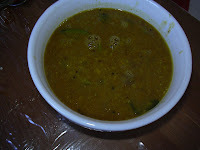 This is another sambar which needs some kind of garnishing This one also a simple one. The main ingredients are as follow..
First pressure cook the Toor dal with a pinch of Turmeric powder in it. Keep it aside. In a small pan, pour a drop of oil and fry, coriander seeds, channa dal, urid dal, fenugreek seeds, red chillies with a pinch of asafoetida powder, to golden brown. Turn off the stove and now add the coconut to the above said ingredients. Grind it into a fine paste and keep it aside. Take a pan, mix the tamarind paste with a cup of water, add turmeric powder + sambar powder + salt + vegetables and let it boil for 7 to 8 minutes till the vegetables become tender. Now add the coconut paste to it and let it boil for another 3 mts. Now add toor dal, again let it boil for another 3 mts. Take a small seasoning pan, preheat oil, add mustard seeds when it splutters add fenugreek seeds, curry leaves and Asafoetida and pour it in the sambar. Now sambar is ready to serve. We can also make this sambar with Okra, Eggplant, Winter melon, Pumpkin, instead of Drumstick.